Observations from my clinical & fertility coaching practice with women and couples just like you who were once wishing to conceive, and who are now happy parents of thriving kids. I’ve been getting a ton of questions lately from women and couples wondering how to boost their fertility naturally. It’s a time in history when 1 in 5 couples faces fertility challenges (that is a HUGE statistic) and I’m seeing new patients every week in my practice needing help with fertility. I took some time to reflect on my experiences working with fertility patients over the past six years. I thought about the couples who have gotten pregnant and now have healthy babies and children, and what they did differently. 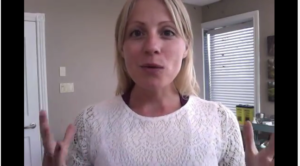 I created this 6-minute video to teach you about the 3 key things that my most fertile couples (now parents) did differently because you can totally do this, too. Setting aside a few months to enrich your health and focus on your fertility, and maybe let go of some other non-essentials you’ve been holding onto that are taking your energy and free time. I’ve noticed it can be helpful to “Think of pregnancy as a gift to be received, rather than a task to be achieved” (Tweetable!) Give yourself permission to “just be” the best of who you are, rather than struggling to do, do, do “all the right things” to try to get pregnant. Choose the best quality food you can afford, and skip the processed stuff. Sugar, white flour, trans fats and pop are fertility killers – the Nurses’ Health Study showed these foods (or non-foods actually!) are linked with the highest rates of infertility and ovulation problems in women. P.S. Three of my clients have recently gotten pregnant during or right after Fueling Their Fertility with my 21-Day Fertility Cleanse Program! Registration has JUST opened for my second launch of this program, as the first one received so much praise! Soon, I’ll open up to a wider audience and need to limit registrations to keep the group private and intimate and ensure I have enough time to respond and coach you personally through our private Facebook group for members only. If you’re ready to make a change for your fertility & wellness now, join me for this 21-Day Fertility Cleanse Program!